Handcrafted elegance with crystal clear optics combined with hand finished hardwood tripods of teak, oak or mahogany, all brass is polished to a high luster which is then clear coated. The Glass Eye has been manufacturing high quality telescopes for over 50 years in America and is the only company that can offer you this type of Optical Quality and Craftsmanship! Don’t be fooled by low priced imported telescopes; they just can’t compare!! 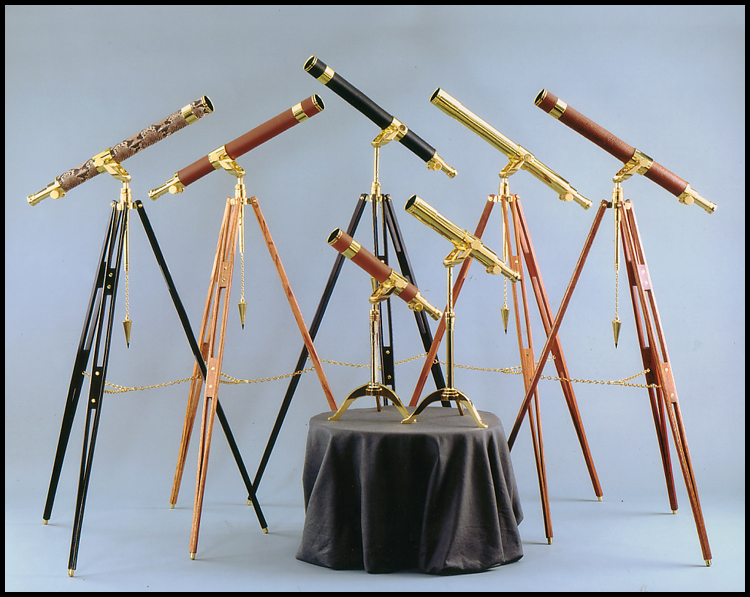 ANTIQUE BRASS TELESCOPES: There are very few genuine antiques available and are priced from $10,000.00 to $75,000.00. Almost always they feature a simple lens erecting system. This system actually removes all of the enjoyment from modern day viewing simply because of low light transfer and narrow field of view. The small telescope (finder scope) that is attached to the main telescope tube is for celestial use only and it becomes useless on the ground. It looks nice but the angle that a person uses on the ground changes from a few yards to no more than a few miles and the “finder scope” can not make up the difference. Antique telescopes feature large, heavy tripod legs that are not only bulky but were manufactured from woods available at that time, primarily dark stained pine. THE FINEST BRASS TELESCOPES IN THE WORLD AT A FRACTION OF THE COST OF AN ANTIQUE. We offer 18th century styling with superb modern day optics. Our solid brass telescope comes with a great selection of hardwoods from which you may choose your custom made tripod. Our optical system features the “Pechan prism” found only in exquisite optical instruments. At THE GLASS EYE, we are dedicated to producing the finest terrestrial (land or ocean viewing telescopes available in the world today. For those individuals who wish to bring any part of their surroundings closer, whether it is a view of the sea, mountains, wildlife or people, these telescopes open a world of enjoyment and knowledge few can imagine. Our high standards are maintained by a very thorough quality-controlled process that takes each and every part through manufacturing to hand-finishing. All component parts start with either virgin foundry castings or the finest solid brass tubing available and then are machined into precision parts in our plant in California. Master machinists and highly trained optical technicians are the only personnel qualified to manufacture the telescopes shown. why our Telescopes are simply the best!